This is a republication of an article posted on VK1OD.net Jun 2012. This article presents a derivation of the power at a point in a transmission line in terms of ρ (the magnitude of the complex reflection coefficient Γ) and Forward Power and Reflected Power as might be indicated by a Directional Wattmeter. Mismatch Loss is also explained. 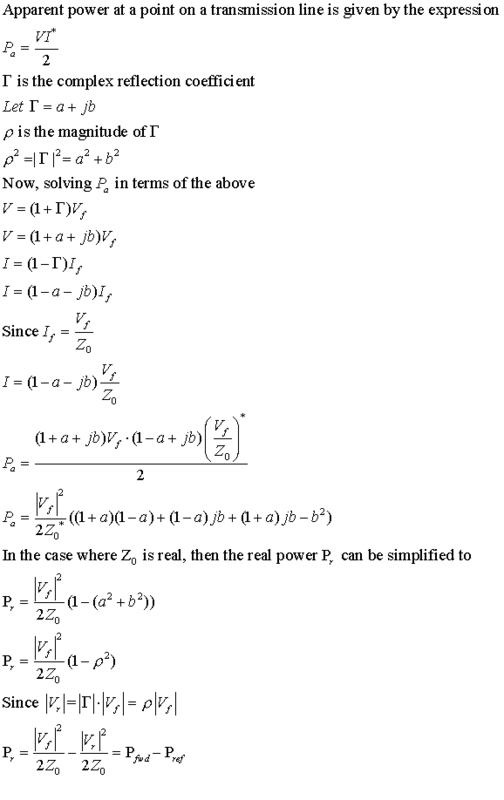 We start by deriving the apparent power Pa in terms of transmission line parameters. Pa has both reactive and real components. We are only interested in the real component of power. The quantity |Vf|2/2Z0 is commonly known as Pfwd, and |Vr|2/2Z0 is commonly known as Pref, but Pr=Pfwd-Pref is true only when Z0 is real. Mismatch Loss is a measure of the reduction of power in a load due to mismatch. From the above, it can be seen that MismatchLoss=-10log(1-ρ2). The definition of Mismatch Loss says nothing of any change in loss or dissipation inside the source, just the reduced power available in the mismatched load.Likewise, the calculation of power and Mismatch Loss from ρ as derived above is valid only if the underlying Z0 is real and the source impedance is exactly Z0. Mismatch Loss is widely misused, if the underlying criteria are not satisfied, the basis for the calculation does not exist and the figure obtained is in error. It is the impedance Zo for which the Directional Wattmeter is calibrated that is important, not the Zo of the transmission line external to the instrument, or even the internal line to a certain extent (neither of which are perfectly real). If the Directional Wattmeter’s sampling element is calibrated for zero Pref on a practical resistive termination at the end of a very short transmission line, the error in assuming that Pr=Pfwd-Pref is very small, insignificant wrt typical standard error of RF power measurement. For example, if a Bird 43 calibrated for 50Ω is inserted in a 75Ω line, Pfwd reads 100W and Pref reads 10W, the power (ie rate at which energy flows past that point) is 90W. Obviously, as Pref approaches Pfwd, the standard error of the calculated power increases, and the technique is of limited use in extreme VSWR cases. it implies nothing about dissipation within source. power equals Forward Power less Reflected Power.